Find and compare the best prices from a range of well known car rental companies at Helsinki-Vantaa Airport. This is a free to use facility, enabeling you to book direct with the company quoting the price. 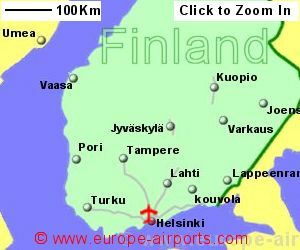 Helsinki-Vantaa Airport, otherwise known as Airport, is located 15Km from the capital city, Helsinki, south Finland. Helsinki has been described as a small, intimate, lively but not too busy city. Helsinki-Vantaa airport has 2 terminals, Terminal 1 for domestic flights and Terminal 2 for International flights, connected by a covered walkway nearly 300m in length. A 900 million Euro develoment plan started in 2014, expected to run until 2020. A 400 million Euro expansion and improvement of the passenger terminal began at the beginning of 2016. There is a bus service to and from the city of Helsinki, or you can take a half hour taxi journey for around 50 Euros. A new rail link between the airport and Helsinki opened in July 2015 and runs approximately every 10 minutes to the city. There are around 19 bars&cafes/restaurants, 40 shops, 4 currency changing facilities , 16 ATMs, VIP lounge, meeting and conference rooms, baby care and play rooms, FREE WiFi internet access, mobile phone charging points, a barber, and a fuel station. The airport is the first in Europe to have sleep pods available for passengers. 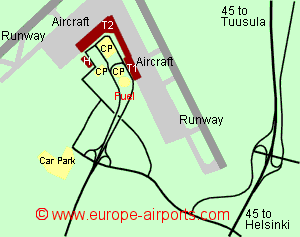 The Hotel GLO Helsinki Airport is located with the Terminal 2 building. The Hilton Helsinki-Vantaa Airport Hotel is located within 200m of the International Terminal and accessed via a covered walkway. Helsinki airport has Airport Carbon Accreditation, at the Neutrality level. 18.9 million passengers passed through Helsinki-Vantaa airport in 2017, a 10% increase from the previous year.